In the wake of Cyclone Idai, Mozambique and much of southern Africa is grappling with widespread flooding, infrastructure damage, food insecurity, and internal displacement. The mounting crisis has been worsened by lingering floodwaters, which threaten epidemics of cholera or other diseases. Such a one-two punch could become increasingly common as climate change intensifies storms in a vulnerable region. 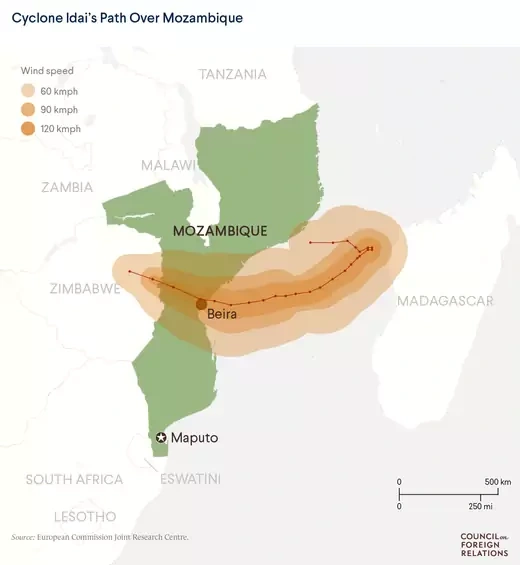 In mid-March, Cyclone Idai made landfall in Mozambique on the eastern coast of Africa, sweeping through the region. The storm has killed more than 830 people, damaged more than one hundred thousand homes, and damaged an estimated $1 billion in infrastructure. Severe flooding throughout Mozambique, Malawi, and Zimbabwe created an inland ocean more than thirty miles wide and leveled the Mozambican city of Beira. The U.S. Agency for International Development (USAID) has estimated that at least six hundred thousand Mozambicans are in need of urgent assistance, including more than four hundred thousand who have been displaced. 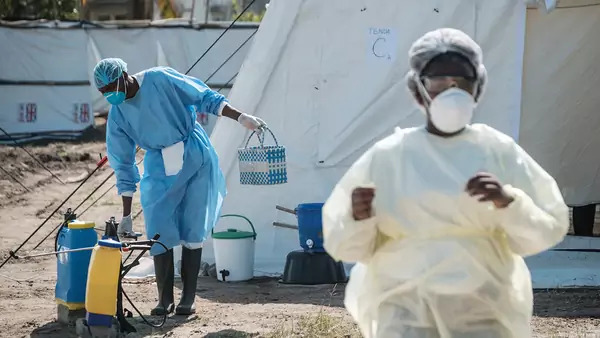 As of April 1, the death toll in Mozambique alone stood at 518 people, and the number is expected to rise due to the challenges facing recovery efforts and the escalating threat of waterborne diseases. The exact toll may never be known given the remoteness of some of the affected areas. A number of multilateral organizations, foreign governments, and nongovernmental organizations have responded. The African Union sent an initial $350,000 in aid and a high commissioner to assess the situation. USAID has provided nearly $3.6 million in support, including water, sanitation, and hygiene resources, and the U.S. military has airlifted food and medical supplies. China has sent doctors to fight an incipient cholera outbreak. Nevertheless, humanitarian efforts have been hindered by road damage and dangerous flood waters blocking access to survivors. To make matters worse, only $40 million of the requested $300 million in emergency UN funding has been made available. Why are authorities concerned about potential disease outbreaks? In addition to sweeping away homes and roads, the widespread flooding damaged water infrastructure and sullied wells. This sparked fears that the lack of safe water, mixed with overcrowding after the storm, created a perfect recipe for malaria, typhoid, and especially cholera, a deadly diarrheal disease caused by drinking contaminated water. On March 27, Mozambique officials confirmed the first five cases of cholera. Since then the number of cases has ballooned to more than one thousand. Mozambique is particularly vulnerable to a cholera outbreak. It is one of the world’s poorest countries, and slowing growth since 2015 has strained an already underdeveloped health-care system. In countries with similarly fragile health systems, such as Haiti and Yemen, sporadic cholera cases in recent years rapidly became pandemics. Yemen’s outbreak has become the worst in history, with more than a million cases and 1,800 related deaths reported. In Mozambique’s less densely populated areas, where the risk of disease is less acute, farmers are worried about food insecurity. Idai damaged nearly one million acres of crops just before the harvest. To prevent a second crisis after the cyclone, aid workers are working to mitigate the spread of disease and treat existing cases. On April 1, the World Health Organization delivered nine hundred thousand doses of oral cholera vaccine. Doctors Without Borders is coordinating with Mozambique’s Ministry of Health to scale up cholera treatment centers and vaccinate people most at risk. But experts say that even as Idai’s floodwaters recede, rising sea levels are likely to make such storms, and the resulting disease and hunger, more frequent. As CFR Senior Fellow Michelle D. Gavin points out, coastal hubs like Mozambique’s Beira, Tanzania’s Dar es Salaam, and Nigeria’s Lagos are particularly at risk. The question is whether African governments and international donors can move beyond crisis response and develop more robust long-term infrastructure.